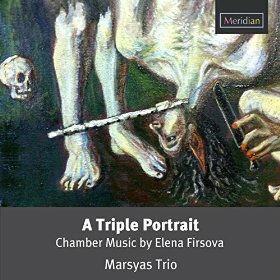 The music of Elena Firsova deserves a wider audience, so this disc, the first to be devoted entirely to her chamber music, is welcome indeed. Firsova was born in Leningrad in 1950, and by the 1980s had become one of the leading ‘unofficial’ composers of the Soviet Union’s burgeoning underground classical scene. But, as with many of that generation, her dissidence was expressed more through willful indifference to state precepts than through explicit opposition to Socialist Realism. Firsova early on developed a distinctive and personal style, certainly Russian in outlook – there is little in the way of Germanic dialectics here, and however Modernist her music is always expressive – but influenced as much by Berg, and even Debussy, as by any Slavic predecessors. Firsova’s music always follows a clear train of thought, or at least of expression, but it is often difficult to rationalize this in terms of thematic or harmonic logic. Such logic is clearly at play, but mood and texture are always just as important in maintaining the flow and character. In 1991, Firsova, along with her husband, Dmitri Smirnov, and children Alissa Firsova and Philip Firsov (now a composer and artist respectively), moved to the UK, and they are now based in St Albans in Hertfordshire. Remarkably, though, the move had little effect on Firsova’s style. The music on this disc spans the period from 1980 to 2012, and the sheer stylistic continuity is remarkable. By circumstance alone, we are obliged to describe Firsova as a UK-based Russian composer, but the style of her work also bears out that description: Always Russian in temperament, yet always cosmopolitan in outlook. Several different instrumental combinations are employed by the program’s various works. We hear solo cello in For Slava (no prizes for guessing which Slava, the work was written in response to Rostropovich’s funeral) and solo piano in Lost Vision. This work was written shortly after the composer was diagnosed (wrongly as it turned out) with a condition that would have led to blindness. Reflection quickly turns to anger and frustration, the only time on this disc that such fierce emotions are expressed. But what power! Firsova’s restraint is clearly one of her greatest compositional assets, but how revealing this brief passage is of unrestrained and wild emotion. Flute and piano combine in Spring Sonata, the earliest work on the disc, dating from 1982. The flute turns out to be the ideal instrument for Firsova’s lighter side. That airy, floating quality that pervades her work comes through clearly in her elegant flute writing. We also hear two song cycles, both to poems by Osip Mandelstam. His work has been a defining influence for Firsova’s music, and she has set his poems more than those of any other writer. The result is a perfect combination of words and music, Firsova’s aesthetic perfectly atuned to Mandelstam’s aphoristic style, seemingly causal expression, but often of very dark sentiments. Two singers join the Trio players for these song cycles, soprano Maacha Debner and mezzo Hannah Pedley, and both sing in eloquent Russian, perfectly capturing the mood of each song. The Trio is also joined by a violin and viola, Patrick Dawkins and Morgan Goff, for the final number, Tender is the Sorrow. Despite the larger ensemble, the scale of the music here remains small. The work is dedicated to the memory of the composer’s aunt Tania, and with her the generation of which she was the last surviving member. It is the perfect culmination to the program, bringing together all the qualities we have heard in the earlier works, the long flowing lines, the bittersweet sentiments, and those light textures that always carry a slightly sinister undercurrent. Performances and recording are excellent throughout. Despite the unusual combination of instruments, the players work closely together and always produce a unified tone. All Saints’ Church in Orpington provides an atmospheric but clear acoustic, admirably captured by Meridan’s “Natural Sound Recording” technology. Informative liner notes from flutist Vidovich, texts in English and transliterated Russian, and an apt, if slightly gruesome cover image by Philip Firsov, the composer’s son. This disc provides an excellent introduction to the music of Elena Firsova. Her work is also represented on a handful of other commercial releases, also worth seeking out. Firsova and her husband, Dmitri Smirnov, have also taken full advantage of Internet to disseminate unpublished recordings of their works, and both have YouTube accounts that are well worth exploring. This review appears in Fanfare Magazine issue 39:1.